Born: July 1966 in Graz (province of Styria), Austria. 1984-1989: Studies of Technical Mathematics at the Graz University of Technology. November 1989: Graduation to "Diplom Ingenieur" (similar to M.Sc. degree) at the Graz University of Technology. Diploma thesis on "Maximum flow problems and minimum cut problems with affine-linear capacities". (Supervisor: Prof. Rainer E. Burkard). 1990-1993: Doctoral Studies at the Department of Mathematics, Graz University of Technology. October 1993: Graduation to "Dr. techn." (Ph.D. degree) at the Graz University of Technology. Ph.D. thesis on "Parametric Approaches to Special Classes of Minimum Concave Cost and Dynamic Flow Problems". November 1999: Habilitation (venia legendi) for "Applied Mathematics" at the Graz University of Technology. Special Cost Matrices and Related Input Restrictions". February 1990 - February 2000: Assistant Professor (Universitätsassistentin) at the Department of Mathematics, Graz University of Technology. 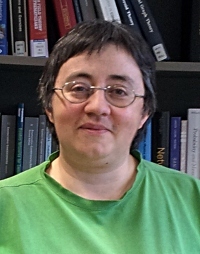 Since March 2000: Associate Professor at the Department of Mathematics, Graz University of Technology. For most of my courses and in particular for those I have given some times ago I am offering examinations on demand. For the larger courses I typically fix the first 2-3 exam dates on the basis of mutual agreement. If you wish to take an exam on one of my courses, please feel free to contact me by sending mail to klinz@opt.math.tu-graz.ac.at. A list of diploma and master theses I have supervised over the years can be found here. A list of PhD theses I have supervised can be found here.